Development and implementation of branded aspects of the physical customer experience environment. Having successfully implemented some high-profile projects for the broadcaster we are delighted to be working as SKY's European Brand Implementation Agency. Amongst the various projects delivered to date have been the creation of a brand portal at London’s O2 Arena, which was used as the starting point for Sky’s retail modernisation programme. Our design engineers and project implementation team worked closely with the nominated brand design house to solve numerous technical elements required for the Sky@O2 brief. 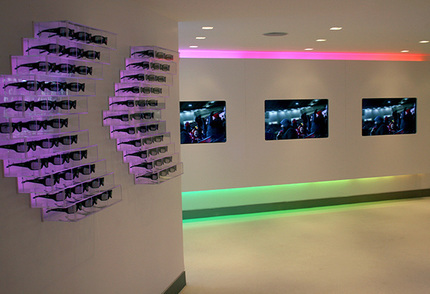 We developed, produced and implemented a unique 3D logo sign for Sky’s new branding that featured a double-sided colourwash LED lighting solution, matching the exact colour sequence chosen by the brand designer. Our team also proposed the construction design and suitable materials for a number of interior components including point of sale accessories, display cases and reception desks. The brief incorporated the development and build of a secure facade and balustrade glazed entrance. Principle managed design amendments from the design agency for the project up until a week before the scheduled installation date, and our teams successfully completed every requirement of the brief. Sky’s team were impressed with the finished environment.